This lovely dome magnifier comes in a deluxe gift box .Can be used as a gift for your loved one or your own beautiful display case. Constructed from pressure formed and polished solid optical acrylic. Perfect magnifier for seniors, students, professionals, people with low vision and macular degeneration. making the dome magnifier the perfect optical tool for enhanced reading of magazines, newspapers, maps, contracts, architecture plans and other reading material. The unique design allows these acrylic dome magnifiers to glides effortlessly across a smooth reading surface and makes reading small print a pleasure. 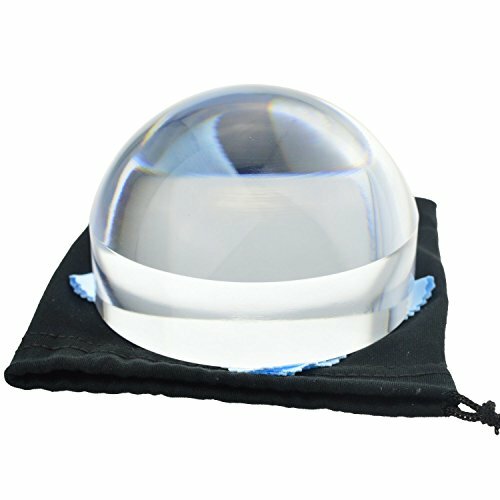 All dome magnifier models include polishing storage pouch. Can be used as Paperweight. Backed by Yoctosun 100% LIFETIME WARRANTY! If you are not satisfied with our product, we will give you a full refund. No questions asked. We just want to give you a 100% risk-free experience by going with Yoctosun products. 5X dome magnifiers offer tremendous value for low vision users. Ideal for examining fine details in newspapers, maps, magazines and other documents. 3.8 inch Distortion Free Dome Magnifier. Comes with polishing pouch, can be used as cleaning cloth. Self-focusing light gathering design, Glides effortlessly across any surface. If you have any questions about this product by YOCTOSUN, contact us by completing and submitting the form below. If you are looking for a specif part number, please include it with your message.